What Is on the Grade Four New York State Mathematics Exam? Every spring in New York, students in grades 3-8 are given a standardized test in English and math. To learn more about what will be on the fourth grade math test and how you can help your child prepare, read on. New York State's math standards were last revised in 2005, and they are in the process of being revised again to align more closely with national standards. The state expects to test fourth grade students on the math standards described below beginning in 2013. Before you can help your child prepare, you must first know what will be on the exam. There are five main topics: algebraic thinking, base ten number operations, fractions, measurement and geometry. There will be questions involving all four operations (addition, subtraction, multiplication and division). 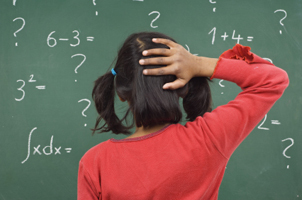 Your child can expect to solve word problems and equations with whole numbers. Additionally, there will be questions testing his or her ability to recognize and create patterns. Your child will likely have to identify place value for large, multi-digit numbers. For instance, for the number 3,421, three is in the thousands place, four is in the hundreds place, two is in the tens place and one is in the ones place. Your child will also use his or her knowledge of place value to round numbers. By fourth grade, students are expected to compare fractions and place them in order. Additionally, there will likely be questions in which your child must convert a fraction to a decimal and vice versa. In this section, your child will have to convert between different units of measurement within the same system (for example, meters to centimeters). Your child will also have to calculate area and perimeter for a variety of shapes. Although the formulas will likely be provided on the test, it may be a good idea for your child to memorize them. Here, your child will classify shapes based on characteristics like parallel lines and right angles. He or she will also have to understand geometry terms like point, ray, angle and line segment. Now that you know what's on the test, it's time for your child to practice. The New York State Education Department offers free practice materials on its website. You can download and print three booklets for the fourth grade math exam. The first booklet contains multiple-choice questions, and booklets two and three contain short response questions. You can also find other helpful resources, like the punch-out tools. These tools include a ruler, counters and pattern blocks. Some questions on the practice test require these tools. An answer key and scoring guide are also available, so you can correct your child's work and identify any mistakes he or she made.